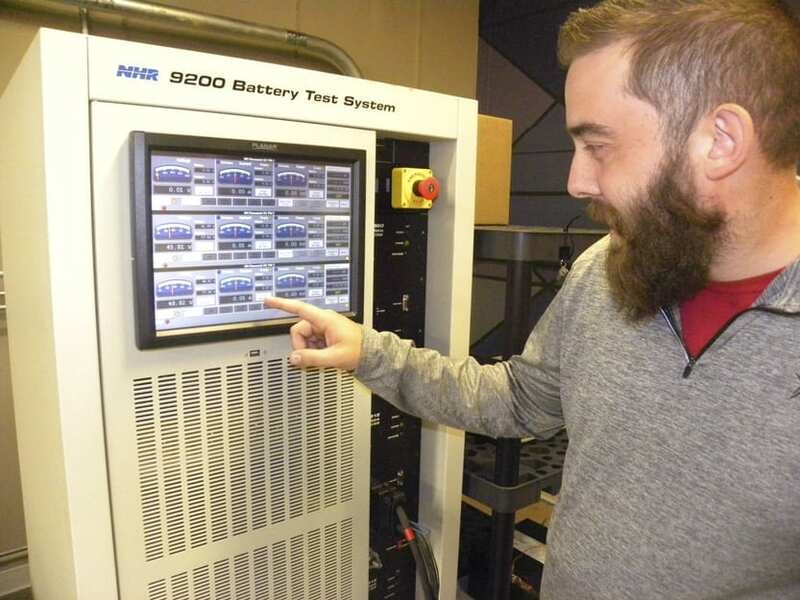 Tribune Chronicle / Christopher Kromer Rick Stockburger, chief operating officer and vice president of the Tech Belt Energy Innovation Center in downtown Warren, works with the organization’s new battery test system. The device is part of TBEIC’s energy lab that opens today. WARREN — Downtown Warren is a growing hub of young entrepreneurs changing the face of the city, and TBEIC — the Tech Belt Energy Innovation Center — is no different. An incubator for 16 tenant companies, as well as the home of a brand new energy lab, TBEIC will take a giant step forward today when it unveils a fleet of new battery testing devices that it hopes will draw businesses from all over the country. At its grand opening today, TBEIC will open up its new battery lab, which will enable businesses to test batteries in several different ways, including predicting the life cycle of a battery and testing its capacity. The centerpiece of the grand opening will be the grid simulator that will enable a company to test a power source and simulate how it would react in a variety of scenarios, including blackouts, brownouts and lightning strikes. The $60,000 simulator was funded out of approximately $500,000 in grants from the federal Appalachian Regional Commission and the Ohio Board of Regents. “What we’re about to finish is going to be a game changer,” said Rick Stockburger, chief operating officer and vice president of TBEIC. Stockburger said it is just not feasible for TBEIC’s tenant companies to buy a grid simulator. He added that some companies may only need to use a grid simulator once or twice and don’t want to buy the expensive machine themselves. This creates an opening for TBEIC to leverage its grid simulator to generate revenue and bring economic activity to the area. Stockburger said the simulator has generated a lot of interest already, with businesses lining up to have their products tested and prepared for industry certification. Companies like Bedford Heights-based Paragon Robotics and pH Matter of Columbus already have expressed a desire to use the grid simulator. Companies located in the Mahoning Valley, as well as Ohio universities and entities from Appalachian states, will receive preferential pricing for testing. While pricing details have not been worked out yet, Stockburger said TBEIC’s prices will be cheaper than anyone else’s because of the organization’s small overhead. The lab will be a key driver of the organizer’s sustainability, allowing it to remain viable. Stockburger said one idea is to charge companies a monthly fee to access the lab and the equipment, with an added cost for use of the grid simulator. U.S. Rep. Timothy J. Ryan, D-Howland, says the energy lab is a “big deal” for Warren and Trumbull County. “To have a lab with equipment for people to come in and test their products is important to getting businesses here,” said Ryan. Ryan secured a $2.2 million earmark in fiscal year 2010 to fund the incubator building at 125 W. Market St. in 2009. But despite the incubator’s momentum, some have asked why it took nearly 10 years from TBEIC’s inception to open its first lab. Stockburger said the piecemeal funding slowed down the process. 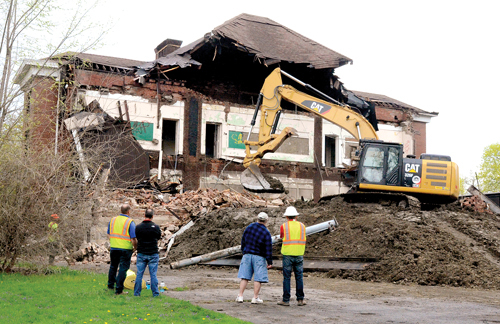 “The earmark was only for the building,” explained Stockburger. “It took almost four years to close the financing.” Other funds had to be secured to operate various portions of the incubator. Ryan agreed with Stockburger’s assessment. Now that TBEIC is moving forward with its energy lab, Tyler Harden, president and CEO of ExoSpec, a managed services IT company, said other businesses will want to relocate. Harden said Warren is on the verge of an economic breakthrough. “Five years from now, Warren won’t be what it is today,” said Harden.